Shawn Peter Raul Mendes (/ˈmɛndɛz/; born August 8, 1998) is a Canadian singer, songwriter and model. He gained a following in 2013, posting song covers on the video-sharing application Vine. The following year, he caught the attention of artist manager Andrew Gertler and Island Records A&R Ziggy Chareton, which led to him signing a deal with the record label. He has since released three studio albums, headlined three world tours, and received several nominations and awards. Mendes released his self-titled debut EP (2014) and his debut studio album Handwritten (2015), whose single "Stitches" reached number one in the United Kingdom and the top 10 in the United States and Canada. He then released his second studio album Illuminate (2016), whose singles "Treat You Better" and "There's Nothing Holdin' Me Back" reached the top 10 in several countries. His self-titled third studio album (2018) was supported by the lead single "In My Blood". All three albums debuted atop the US Billboard 200, with the first one making Mendes one of five artists ever to debut at number one before the age of 18, and the third one making him the third-youngest artist to achieve three number one albums. In 2017, Mendes became the first artist to land three number one singles on the Billboard Adult Contemporary chart, and in 2018, became the first artist achieve four number one singles on the Adult Pop Songs chart, before the age of 20. For the album, see Shawn Mendes (album). Shawn Peter Raul Mendes (/ˈmɛndɛz/; born August 8, 1998) is a Canadian singer, songwriter and model. He gained a following in 2013, posting song covers on the video-sharing application Vine. The following year, he caught the attention of artist manager Andrew Gertler and Island Records A&R Ziggy Chareton, which led to him signing a deal with the record label. He has since released three studio albums, headlined three world tours, and received several nominations and awards. Mendes released his self-titled debut EP (2014) and his debut studio album Handwritten (2015), whose single "Stitches" reached number one in the United Kingdom and the top 10 in the United States and Canada. He then released his second studio album Illuminate (2016), whose singles "Treat You Better" and "There's Nothing Holdin' Me Back" reached the top 10 in several countries. His self-titled third studio album (2018) was supported by the lead single "In My Blood". All three albums debuted atop the US Billboard 200, with the first one making Mendes one of five artists ever to debut at number one before the age of 18, and the third one making him the third-youngest artist to achieve three number one albums. 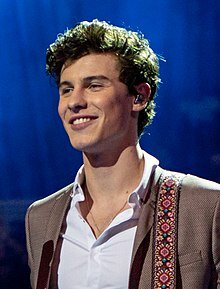 In 2017, Mendes became the first artist to land three number one singles on the Billboard Adult Contemporary chart, and in 2018, became the first artist achieve four number one singles on the Adult Pop Songs chart, before the age of 20. Mendes has headlined three concert tours: ShawnsFirstHeadlines, Shawn Mendes World Tour and Illuminate World Tour. Among his accolades, Mendes has won 13 SOCAN awards, three Juno Awards, ten MTV Europe Music Awards, eight iHeartRadio MMVAs, two American Music Awards, and received two Grammy Award nominations. In 2018, Time named Mendes one of the 100 most influential people in the world on their annual list. Mendes was born in Toronto, Ontario, the son of Karen Mendes (née Rayment), a real estate agent, and Manuel Mendes, a businessman, who sells bar and restaurant supplies in Toronto. His father is Portuguese (from the Algarve), while his mother is English. He has a younger sister named Aaliyah. Mendes was raised in Pickering, Ontario, where he attended Pine Ridge Secondary School. At school, Mendes played ice hockey and soccer, joined his high school glee club and practised his stage presence in acting lessons (leading as Prince Charming at one point). He also auditioned for Disney Channel in Toronto. Mendes graduated from high school in June 2016. Mendes was raised in a religious family. Mendes was listed among Time's The 25 Most Influential Teens of 2014, debuting in the list after being the youngest-ever artist to debut in the top 25 of Billboard Hot 100. He was listed in Time's The 30 Most Influential Teens of 2015, making the list after his debut album topped the Billboard 200 and his single "Stitches" made the top 10 in the US and other countries. On March 22, 2018, Mendes released the lead single "In My Blood" from his upcoming third studio album, followed up by the second single "Lost in Japan" on March 23. "In My Blood" topped the Billboard Adult Pop Songs chart, making Mendes the first and only artist to have four number one singles in the chart before turning 20 years old. "Youth" released on May 3 and featured with American singer Khalid. His self-titled studio album was released on May 25, 2018 to positive critical reviews, with particular praise towards his songwriting and artistic growth. It debuted at number one in Canada, making it his third number one album in his home country. It debuted at number one on the US Billboard 200, making Mendes the third youngest artist to collect three number-one albums. To promote the album, Mendes will embark on his self-titled world tour in 2019. Besides the tour, he performed at various music festivals across Europe, North America and South America. He performed at a televised concert honouring the 92nd birthday of Queen Elizabeth II on April 21, 2018. He made TV show appearances on The Late Late Show with James Corden in June where he sang one of his latest singles each night for a week. The tracks he performed live were "Nervous", "Lost in Japan", "Perfectly Wrong", and the duet with Julia Michaels "Like to be You". Mendes made an appearance on the late-night talk show The Tonight Show Starring Jimmy Fallon in October and performed Lost in Japan. He, together with Fallon and the show's resident band The Roots, performed a special version of "Treat You Better" for the show's Classroom Instruments series. He has also performed his latest singles on the iHeartRadio MMVAs in Canada on August 27, where he received eight nominations and won four awards. Mendes and Zac Brown Band were featured in an episode of the American TV program CMT Crossroads, a show that pairs a country musician with a musician from another genre. The episode was aired on October 24 and was taped a month before the scheduled airing date. Mendes and Zac Brown Band performed nine songs, where they sang parts of each other's songs and covered Michael Jackson's "Man in the Mirror". Parts of the dialogue between Mendes and Zac Brown Band, talking about music and experiences throughout their career, were shown in between the song performances. On November 1, Mendes was announced as one of the musical performers for the 2018 Victoria's Secret Fashion Show which was recorded in New York City in November, and aired in December. He released a three-song remix EP on December 21 entitled The Album (Remixes). The EP includes songs from his self-titled album such as "Where Were You in the Morning?" with Kaytranada, "Why" with Leon Bridges and "Youth" with Jessie Reyez. On February 16, 2019, Mendes announced that he was the latest brand ambassador for Calvin Klein’s #MyCalvins campaign. In October 2018, Mendes, together with producer Teddy Geiger, released a cover of "Under Pressure", the single by British band Queen and English singer David Bowie. The single will be part of a series of covers of Queen's songs, released in celebration of Queen's upcoming biopic titled Bohemian Rhapsody. The proceeds from the single will be donated to the "Mercury Phoenix Trust", an organization founded by the Queen bandmembers after Mercury's death, which helps fight against HIV/AIDS. Queen's manager, Jim Beach, expressed his gratitude to Shawn Mendes and Universal Music Group for helping the cause. Mendes has received several nominations and won awards, including 13 Society of Composers, Authors and Music Publishers of Canada (SOCAN) awards, ten MTV Europe Music Awards (EMA), eight iHeartRadio Much Music Video Awards (MMVA), three Juno Award, three BMI Awards, two American Music Awards, and the Allan Slaight Honour from Canada's Walk of Fame. Among his awards, he won Juno Award's Single of the Year for "There's Nothing Holding Me Back" in 2018, SOCAN's Songwriter of the Year, and iHeartRadio MMVA's Artist of the Year. 1 2 3 "Shawn Mendes". models.com. ↑ "Shawn Mendes: o rapaz do momento". noticiasmagazine.pt. October 23, 2015. Retrieved February 2, 2016. ↑ "HAPPY BIRTHDAY TO MY BEAUTIFUL SISTER !". Shawn Mendes Official Twitter. September 15, 2015. Retrieved December 28, 2015. ↑ "Shawn Mendes: How a six-second video launched the next Justin Bieber". Telegraph.co.uk. January 16, 2015. Retrieved January 27, 2015. ↑ "Shawn Mendes Was Nearly A Disney Kid". iHeartRadio. Canada. July 10, 2017. Retrieved November 9, 2018. ↑ "Shawn Mendes Finally Graduated High School Yesterday". Teen Vogue. June 29, 2016. Retrieved October 18, 2018. ↑ Marine, Brooke (8 May 2018). "Shawn Mendes Opens Up Before His First Met Gala About His Friend Hailey Baldwin, Being a Romantic at Heart, and His New Music". W Magazine. Retrieved 6 November 2018. "Forever, religion is going to have a massive impact on people's fashion. It always has been and always will be," Mendes—who later revealed he did come from a religious upbringing—told W when asked how he planned to incorporate the theme into his look for the evening. ↑ "Shawn Mendes: 5 things you didn't know". AXS. April 23, 2015. Retrieved February 12, 2017. ↑ "Getting Honest With Shawn Mendes". Honest Blue. Archived from the original on June 5, 2014. Retrieved April 30, 2018. ↑ "Shawn Mendes: 5 Things You Need To Know About The Vine Star Turned Chart-Topping Singer (PHOTOS)". Headlines & Global News. October 21, 2015. Retrieved 2015-11-14. ↑ "How Shawn Mendes Is Turning Vine Fame into A Music Career". Billboard. July 18, 2014. Retrieved July 18, 2014. ↑ "Shawn Mendes, 15-Year-Old Vine Celebrity, Makes Record-Breaking Debut on Billboard Hot 100". Idolator. July 2, 2014. Retrieved July 13, 2014. ↑ "Girls go gaga for Vine video boys at Itasca meet and greet DailyHerald.com". Daily Herald. March 3, 2014. ↑ Gregory, Ted (February 21, 2014). "Viners' meet and greet fosters teen idol frenzy Boys encounter stardom as popular producers of Twitter app's 6-second videos". Chicago Tribune. ↑ "'Secret' is out: Austin Mahone announces album, tour". USA Today. April 4, 2014. ↑ Caulfield, Keith (April 15, 2015). "Shawn Mendes Album on Course for No. 1 Debut on Billboard 200 Chart". Billboard. Retrieved October 2, 2015. ↑ Brown, Harley (June 4, 2014). "Vine Superstar Shawn Mendes Signed to Island Records (Exclusive)". Billboard. ↑ "The Vamps Release Remix of 'Oh Cecilia (Breaking My Heart)' Feat. Shawn Mendes [LISTEN]". popcrush.com. ↑ "Shawn Mendes' New Single 'Something Big' Is Actually Something Huge". MTV.com. ↑ Caulfield, Keith (April 22, 2015). "Shawn Mendes' 'Handwritten' Debuts at No. 1 on Billboard 200 Chart". Billboard. Retrieved August 31, 2015. 1 2 3 4 "You searched for shawn mendes — RIAA". RIAA. Retrieved 22 August 2017. ↑ Daw, Robbie (22 April 2015). "Shawn Mendes Becomes Youngest Artist To Top Album Chart In Half A Decade — idolator". idolator. Retrieved 22 August 2017. ↑ Trust, Gary (October 26, 2015). "The Weeknd Tops Hot 100; Adele No. 1 Next Week?". Billboard. Retrieved October 26, 2015. 1 2 3 4 Trust, Gary (November 15, 2015). "Shawn Mendes Is the First Artist to Land Four No. 1s on the Adult Pop Songs Chart Before Age 20". Billboard. Retrieved 23 September 2018. 1 2 3 Trust, Gary. "Shawn Mendes Is First Artist in AC Chart's History to Notch Three No. 1s Before Age 20". Billboard. Retrieved 23 September 2018. ↑ Copsey, Rob (January 22, 2016). "It's not a stitch-up! Shawn Mendes knocks Bieber off Number 1". Official Charts Company. Retrieved January 24, 2016. ↑ Glatter, Hayley (June 12, 2015). "Shawn Mendes Wrote a New Song for Disney's "Descendants" Soundtrack!". Seventeen. Retrieved November 5, 2018. ↑ "Vance Joy, Shawn Mendes tapped to support Taylor Swift on her "1989" tour". Headline Planet. November 3, 2014. ↑ "Shawn Mendes & Camila Cabello Announce 'I Know What You Did Last Summer' Duet: Hear a Preview". Billboard. Retrieved 2015-11-14. ↑ "The 25 Most Influential Teens of 2014". TIME Staff. Time. October 13, 2014. Retrieved November 16, 2015. ↑ "The 30 Most Influential Teens of 2015". TIME Staff. Time. October 27, 2015. Retrieved November 16, 2015. ↑ "Watch Shawn Mendes Bring Sweet, Beautiful Music To 'The 100′". MTV news. Retrieved January 18, 2016. ↑ Spanos, Brittany (January 28, 2016). "Shawn Mendes Announces Second Headlining World Tour". Rolling Stone. Retrieved January 31, 2016. ↑ Guardia, Niko; Berkofsky, Blossom. "Shawn Mendes' World Tour Sells Out in Minutes — Music News — ABC News Radio". ABC News Radio. Retrieved 22 August 2017. ↑ "Shawn Mendes Tries to End an Abusive Relationship in 'Treat You Better' Video". Billboard. July 12, 2016. Retrieved July 13, 2016. ↑ Caulfield, Keith (October 2, 2016). "Shawn Mendes Earns Second No. 1 Album on Billboard 200 With 'Illuminate'". Billboard. Retrieved October 3, 2016. ↑ Ceron, Ella (August 18, 2016). "Shawn Mendes's New Song "Mercy" Will Break Your Heart". Teen Vogue. Retrieved December 24, 2016. ↑ "Shawn Mendes Gifts Fans Early: 'Live at Madison Square Garden' Coming Friday". Billboard. December 19, 2016. ↑ Atkinson, Katie. "Shawn Mendes Performs 'Mercy' & 'Treat You Better' on 'Saturday Night Live'". Billboard. Retrieved 22 August 2017. ↑ Middleton, Ryan (September 8, 2016). "Shawn Mendes Announces 2017 Illuminate World Tour Dates". musictimes.com. Retrieved December 28, 2016. ↑ Wilker, Deborah. "Shawn Mendes Rocks His Dream Stage at Sold-Out L.A. Staples Center Concert". Billboard. Retrieved August 24, 2017. ↑ McClean, Craig. "Shawn Mendes: I was the most upset I've ever been after Manchester". Evening Standard. Retrieved August 24, 2017. ↑ Weatherby, Taylor (April 20, 2017). "Shawn Mendes Drops Feisty New Single 'There's Nothing Holdin' Me Back'". Billboard. Retrieved May 24, 2017. ↑ McIntyre, Hugh (July 17, 2017). "Shawn Mendes Grabs Another Top 10 Hit, While 'Despacito' Leads For Week 10". Forbes. Retrieved August 24, 2017. ↑ "Shawn Mendes' "There's Nothing Holdin' Me Back" tops "Billboard's" Pop Songs chart — Music News — ABC News Radio". ABC News Radio. August 15, 2017. Retrieved August 24, 2017. ↑ Trust, Gary. "Shawn Mendes First Artist Under 20 to Land Three No. 1s on Adult Pop Songs Chart". Billboard. Retrieved 29 August 2017. ↑ Trust, Gary. "Shawn Mendes Is First Artist in AC Chart's History to Notch Three No. 1s Before Age 20". Billbaord. Retrieved 23 September 2018. ↑ "The 30 Most Influential Teens of 2016". TIME Staff. Time. October 19, 2016. Retrieved August 27, 2018. ↑ "Forbes 30 Under 30: Music". Forbes. January 3, 2016. Retrieved January 4, 2016. ↑ "21 Under 21 2017: Music's Next Generation". Billboard. Retrieved 13 October 2018. ↑ "Hear Shawn Mendes' Raw New Song 'In My Blood'". ↑ "Shawn Mendes on Twitter". Twitter. ↑ Tucker, Eric (May 7, 2018). "Shawn Mendes and Khalid release 'Youth'". Mix 106. Retrieved January 22, 2018. ↑ Brandle, Lars (April 26, 2018). "Shawn Mendes Shares Artwork, Track List and Release Date for New Album". Billboard. Retrieved April 26, 2018. ↑ Caulfield, Keith (June 3, 2018). "Shawn Mendes Scores No. 1 Album on Billboard 200 Chart". Billboard. Retrieved June 4, 2018. ↑ Jones, Abby (May 8, 2018). "Shawn Mendes Announces Self-Titled International Arena Tour". Billboard. Retrieved May 8, 2018. ↑ "Stars like Tom Jones and Kylie Minogue shine for Queen's 92nd birthday party". ↑ "Shawn Mendes Is Crashing With James Corden At The Late Late Show For A Week". Retrieved 23 September 2018. ↑ "Shawn Mendes:Nervous #LateLateShawn". Retrieved 9 October 2018. ↑ "Shawn Mendes:Lost In Japan #LateLateShawn". Retrieved 9 October 2018. ↑ "Shawn Mendes:Perfectly Wrong #LateLateShawn". Retrieved 9 October 2018. ↑ "Shawn Mendes:Like to be You #LateLateShawn". Retrieved 9 October 2018. ↑ "Shawn Mendes- Lost in Japan". Retrieved 13 October 2018. ↑ Longmire, Becca. "Shawn Mendes Joins Jimmy Fallon To Perform 'Treat You Better' Using Classroom Instruments — Watch!". ET Canada. Retrieved 9 October 2018. ↑ "Shawn Mendes Dominates iHeartRadio MMVAs 2018". Billboard. Retrieved 27 August 2018. ↑ "Shawn Mendes' New Documentary Is Confirmed: Here's Where To Watch It". CapitalFM. Retrieved 23 September 2018. ↑ "SHAWN MENDES – Artist Spotlight Story (Official Trailer)". Retrieved 23 September 2018. ↑ "SHAWN MENDES – Artist Spotlight Stories". Retrieved 9 October 2018. ↑ Bein, Kat. "Zedd Turns Shawn Mendes' 'Lost In Japan' Into a Neon Fantasy: Watch". Billboard. Retrieved 9 October 2018. ↑ Weatherby, Taylor. "Shawn Mendes, Zedd & Camila Cabello To Perform at 2018 American Music Awards". Billboard. Retrieved 9 October 2018. ↑ "Shawn Mendes, Zedd – Lost in Japan (Live from the AMAs / 2018)". Retrieved 13 October 2018. ↑ "21 Under 21 2018: Shawn Mendes, Juice WRLD, Noah Cyrus & More". Billboard. Retrieved 13 October 2018. ↑ Kelly, Hunter. "Shawn Mendes on Working With Zac Brown Band, Country-Pop Fusion". Rolling Stone. Retrieved 25 October 2018. ↑ Bajgrowicz, Brooke. "Victoria's Secret Fashion Show Performers Announced: Shawn Mendes, Halsey, The Chainsmokers & More". Billboard. Retrieved 3 November 2018. ↑ Bajgrowicz, Brooke. "Shawn Mendes Drops Remix EP Featuring Leon Bridges, Jessie Reyez & Kaytranada". Billboard. Retrieved 21 December 2018. ↑ David Jeffries. "Shawn Mendes AllMusic". AllMusic. Retrieved November 11, 2017. 1 2 "Shawn Mendes on Grown-Up New LP, John Mayer's Advice, Dream Acting Role". Rolling Stone. September 23, 2016. Retrieved October 29, 2016. ↑ Lynn, Jennifer (September 2, 2014). "MTV Meets: Shawn Mendes". MTV. Retrieved September 27, 2015. ↑ Pankey, William (May 27, 2015). "Q&A: Shawn Mendes talks touring, musical influences and having a No. 1 album". AXS. Retrieved September 27, 2015. ↑ "Shawn Mendes Says John Mayer Was The Inspiration Behind His Second Album". ET Canada. September 23, 2016. Retrieved April 4, 2018. ↑ Schiller, Rebecca (March 23, 2018). "Shawn Mendes Talks Justin Timberlake-Inspired 'Lost in Japan,' Says He's 'Really Proud' of 'In My Blood': Watch". Billboard. Retrieved March 23, 2018. ↑ "Shawn Mendes, Pop Idol, Is Not Banking on a Gimmick". The New York Times. September 20, 2016. Retrieved October 18, 2016. ↑ "Shawn Mendes Is The First Face Of Issue 104". Clash Magazine. Retrieved 23 August 2017. ↑ McCall, Tyler (January 5, 2016). "Shawn Mendes Gets Modelling Contract". Teen Vogue. Retrieved February 27, 2016. ↑ Roth, Madeline (4 January 2016). "SHAWN MENDES IS A MODEL NOW — AND THESE PICS PROVE HE'S A NATURAL". MTV News. Retrieved 18 December 2018. ↑ "Shawn Mendes – Model". www.wilhelmina.com. ↑ "Emporio Armani Extends Partnership With Shawn Mendes". WWD. ↑ "Shawn Mendes Takes Turn on Emporio Armani Runway at Milan Fashion Week". Billboard. Retrieved 28 October 2018. ↑ Weatherby, Taylor. "Shawn Mendes Models New Emporio Armani Watches For EA Connected Campaign". Billboard. Retrieved 28 October 2018. ↑ "Shawn Mendes Strips Down to His Underwear for Calvin Klein Campaign". Billboard. Retrieved 2019-02-17. ↑ Abel, Alex (August 28, 2014). "Join Shawn Mendes to Combat Low Self-Esteem & Spread LOVE!". seventeenmag. Retrieved October 20, 2016. ↑ Kassoy, Ben (August 13, 2015). "How Shawn Mendes is Spreading Happiness with Little Notes". Teen Vogue. Retrieved December 24, 2016. ↑ Webster, Emma Sarran. "The One Note Shawn Mendes Wishes He Could Leave Everywhere He Goes". Teen Vogue. Retrieved 23 August 2017. ↑ Bliss, Karen (November 11, 2015). "Shawn Mendes Wants To Continue Making a Difference, Perhaps Go to Africa". SamaritanMag. Retrieved October 20, 2016. ↑ Tenreyro, Tatiana. "Shawn Mendes Teams Up With Red Cross For Mexico Earthquake Relief Campaign, $100,000 Already Donated". Billboard. Retrieved 12 December 2017. ↑ "Meet Shawn Mendes and Sit Front Row at His Show". Retrieved 30 September 2018. ↑ "How to watch the 2018 Global Citizen Festival". Retrieved 30 September 2018. ↑ "Leave No Girl Behind International". Retrieved 30 September 2018. ↑ "Shawn Mendes Urges Fans To Join Him In Supporting #LeaveNoGirlBehind Ahead Of Global Citizen Performance". ET Canada. Retrieved 30 September 2018. ↑ "Shawn Mendes Teams Up With Teddy Geiger For Cover Of Queen-Bowie Classic 'Under Pressure'". ET Canada. Retrieved 14 October 2018. ↑ "Hear Shawn Mendes, Teddy Geiger Cover Queen's 'Under Pressure'". Rollong Stone. Retrieved 14 October 2018. ↑ "Listen now: Shawn Mendes covers Queen's "Under Pressure" to benefit fight against AIDS". ABC Radio. Retrieved 14 October 2018. ↑ "Shawn Mendes & Teddy Geiger Cover Under Pressure To Honour Freddie Mercury". People Magazine. Retrieved 14 October 2018. ↑ Lenniger, Shea. "Shawn Mendes, Charlie Puth, Meghan Trainor & More Team Up for 'We Can Survive' Concert". Billboard. Retrieved 22 October 2018. ↑ "Shawn Mendes undergoes therapy to cure anxiety". Business Standard. April 21, 2018. Retrieved April 22, 2018. ↑ Real, Evan (24 June 2016). "Shawn Mendes Responds to Rumors About His Sexuality". Us Weekly. Retrieved 27 November 2018. ↑ Brammer, John Paul (9 May 2018). "Let Shawn Mendes Be Heterosexual in Peace". them. Retrieved 27 November 2018. ↑ Doyle, Patrick (26 November 2018). "Shawn Mendes: Confessions of a Neurotic Teen Idol". Rolling Stone. Retrieved 27 November 2018. ↑ "Shawn Mendes To Receive The 2015 Allan Slaight Honour". ET Canada. Retrieved 23 September 2018. ↑ "Junos 2018: the complete list of winners | CBC Music". CBC. Retrieved 2018-04-17. ↑ "Shawn Mendes to earn Songwriter of the Year at 2018 SOCAN Awards". socan.ca. SOCAN. Retrieved June 14, 2018. ↑ Bliss, Karen. "Shawn Mendes Dominates iHeartRadio MMVAs 2018". Retrieved 27 August 2018.